Prolific. Immensely talented. Beyond intense. 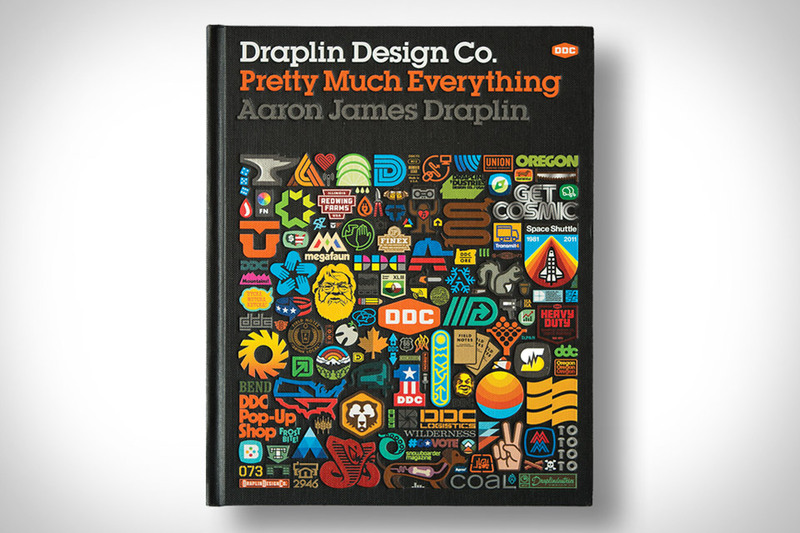 All of these things describe our friend Aaron Draplin, and are readily apparent in Draplin Design Co.: Pretty Much Everything. Described as a "mid-career survey" of his work, inspiration, and more, this nearly 300-page book includes full-color examples of his designs in fields ranging from brand logos to Field Notes, amusing commentary and advice from the man himself, and observations on contemporary design. A must for anyone who's interested in design, typography, or obsessive collections of matchbooks. It doesn't matter whether you're a serious cinephile or just enjoy the occasional blockbuster — The Movie Book is likely to teach you a thing or two about the silver screen. Beginning with 1902's La Voyage Dans La Lune and continuing through modern day, this clever catalog covers over 100 of the best, most influential movies ever made, exploring the central themes and legacy of each through a series of photos, infographics, timelines, posters, informative text, and quotes. Perfect coffee table fodder for your home theater. You don't need to be a boy scout or sailor to know how to tie a good knot. The Complete Book of Knots offers detailed, easy-to-read instructions on how to tie over 100 knots, with each entry accompanied by some background information and step-by-step color illustrations. Also included is a glossary of terms, a quick-glance guide to choosing the right knot for the job, and information on selecting the right rope, whether you're securing a boat to a dock or using string to tie up a package. Featuring over 1,700 pizza stops from around the globe, Where To Eat Pizza might be the definitive guide for enthusiasts. Compiled by food critic Daniel Young, it's packed with tidbits of knowledge from chefs, critics, and industry experts. From the best sauces to which crusts contribute to the perfect slice, it's loaded with the information every pizza fanatic craves. Reddit's Ask Me Anything is a unique forum where regular dudes like us can ask celebs and other interesting people direct questions. The only problem is that those interviews are often lost in the ether of the web, until now. Ask Me Anything: Volume 1 compiles some of the best interviews, from Bill Gates to grillmasters at Waffle House. It also includes original portraits of many of the interview subjects, but is limited to only 10,000 copies. Setting up a home bar can be daunting, given the huge array of liquors to choose from. The 12 Bottle Bar will have you up and mixing with a minimum amount of fuss. Penned by the authors of 12bottlebar.com, it includes over 200 drink recipes, including martinis, sours, and manhattans, all built using a base of eight liquors, two vermouths, and two bitters. Also included is a guide to buying the right bottles, and detailed info on everything from garnishes and syrups to ice. The arctic, and in particular the North Pole, represents some of the last true wilderness on Earth. It's also in serious peril. It's with these two themes in mind that Arctica: The Vanishing North takes you on a journey through this pristine locale. Author Sebastian Copeland, who also happens to be the photographer as well as an accomplished polar explorer and activist, provides a perspective of the pole's beauty, charm, and current predicament that could only come from someone who's not only been there, but obviously cares a great deal about its future.